Our 8ft x 2ft vegetable bed is perfect for growing your vegetables and flowers. The vegetable bed allows enough space between each vegetable, so they can grow efficiently. The boards are made of 0.5 inch thick Cedar wood that is built to last through the seasons. There is a divider in the middle of the box, so you can plants two different plants in it. 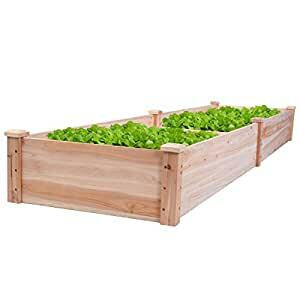 With this planting box, you can plant any vegetables as you want, and you can use this bed on your backyard, lawn, or garden. If you are plan to plant something.